Born and raised in Worcester, Massachusetts, I am the oldest of three. I grew up in a quiet residential area. My middle school years were spent at Worcester Central Catholic and then I went to Holy Name Central Catholic High which I graduated from in 1982. During high school I worked in the radiology department of a local hospital and did some waitressing as well. After attending Rob Roy Academy I became a manicurist for about a year before taking a job as a Dental Assistant. It was there that I realized how interesting the dental field really was. I worked for the same doctor for about two years until there was an office fire and I had to leave. 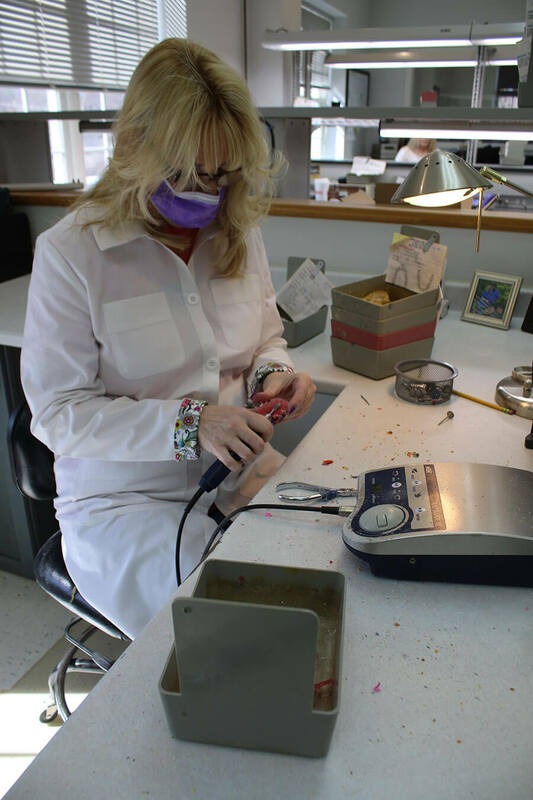 Because I had enjoyed the field initially, I pursued my X-ray Certification and continued working as a dental assistant for nearly two more years until the doctor relocated to another state. Early 1992, I came across an ad for an Orthodontic Technician with artistic ability. Since I had some acrylic experience from my manicuring days and I have artsy flair, I answered the ad and was hired. This year will mark my 25th Anniversary with Parklund Labs. Here at Parklund I work in the Acrylic Department and do all facets of acrylic work. No two appliances are alike which makes my job interesting to say the least. I hope to continue my work in this field and must say I owe a lot of gratitude to my husband who supported my very long hours when the business was in its early days. Also, I must mention that I have a great boss which makes all the difference in the world. I hope to continue here for many, many years.